It was a lazy start to the day and our legs were still tired from two days of mountain visits although all we did was sit on the cog wheel trains admiring the genius Swiss engineering. If you plan to visit Lucerne and wish to live around the old town, then I suggest you book fairly in advance. Husband and I were late in planning the stay at Lucerne so we had to settle with Ibis, which I had to admit had a decent location but a very tiny room with a very weird half see through bathroom door. Also when we booked the room, the room was meant to be big enough for 3 people to stay but off course we must have missed the fine print and the third bed was actually a bunk bed that I feared would fall and suffocate me at night. Thankfully nothing of that sort happened and we checked out in the morning and headed straight to the city centre. We headed to a Starbucks near the train station to grab some breakfast and we ordered a croissant and a coffee. When they handed the coffee, the croissant and the bill to us, the husband noticed that the bill receipt said ham and cheese croissant so we enquired about it and requested them to replace it. Not only did they refuse to do it but also started shouting at us in German, something that I found very unusual for such a otherwise friendly place like Switzerland. When the husband pointed out that they had indeed labelled the stuff incorrectly on the display window, and nowhere it was mentioned that it was ham and cheese, they refused to accept saying that we should have confirmed anyways. Until now, I was quiet but this didn't go down to well with me. All this while, the husband was being polite to the otherwise rude lady, but at this point, I had totally lost it and I told her we dont need anything from them and we were leaving and I kept saying it while she kept blabbering something in German. I have to say, it was quite a gamble but she then reluctantly offered us a chocolate muffin instead which I accepted with at least equal, if not more reluctance. Although it wasn't a very good start to the day, I fell in love with Lucerne. Lucerne is a small town with picturesque bridges and beautiful water promenades with the backdrop of the mighty mountains. The town is bustling with vibrant colours and amazing music fills the sunny plazas. Full of small souvenir shops, Lucerne is one of the favourite tourist destinations especially because it acts as a gateway to Central Switzerland. We had planned to walk around the town following the Lonely Planet book and the first stop was Kapellbrucke or the Chapel Bridge. The 170 metre wooden bridge that spans river Reuss is named after the nearby St. Peter's Chapel. Built in 1333, it is one of the oldest wooden bridges in Europe built as a part of fortifications of Lucerne with the purpose of connecting the old part of town on the right bank with the new part on the left and to serve as protection from any attacks. Adorned with colourful flowers along the entire 170 meter length, it is wonderful to stroll across the creaky wooden bridge. Part of the bridge is also a “Water Tower” which is original, but its gabled roof is a modern reconstruction, rebuilt after a disastrous fire in 1993. The bridge's interior is famous for some high quality paintings, dating back to 17th century. 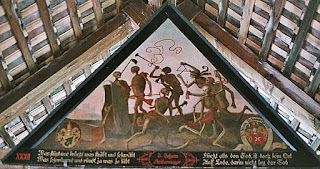 As you cross the bridge, note that it has paintings hanging below its roof in triangular shape and depict events from the history, paintings that present life and death of Lucerne’s patron saint St. Leger to legends of city’s other patron saint St. Maurice. They were painted in 17th century by a local Catholic painter Hans Heinrich Wägmann however in 1993 on August 18th, fire broke out, probably from the cigarette, and destroyed two thirds of paintings. At the other side of the bridge is the beautiful Jesuit Church. The bridge and the church are visible in the song “Jara Gunguna Lein Chalo” of the movie Laaga Chunri Me Daag starring Rani Mukherjee and Abhishek Bachhan. Offcourse, we didnt know it then but few days later on a lazy sunday afternoon, the husband and I would get excited to see this bridge in a song. When you cross the bridge, you arrive at St Peters chapel and next to is is Kapellplatz. In the center of the square is a fountain commemorating Carnival revelry in Lucerne. The Kapellplatz surrounds the 18th century chapel which was built over a former 12th century. The exterior walls are adorned with several works of art and a carving of the Mount of Olives remains from the previous church building. On the square you will see an unusual fountain - called the Fritschi Fountain that was built in 1918 in the style of much older Renaissance style fountains. On the top are painted allegorical figures. The fountain is named after Brother Fritzi, a legendary figure and supposedly his grave is under the fountain. No one knows who Brother Fritschi really was. The legend goes back to around 1450 and the most probable explanation is that there was a farmer living outside town who left some money to the Safran guild on condition that they serve wine to the poor during Fasacht. The guild is still fulfilling this obligation today. We crossed to the other side again and went around small lanes soaking in the charm of this town until we were in front of the Jesuit Church. We went back and forth but could not find the entrance until we saw a notice put on the door. It wasnt in English but we could gather that it is closed for renovation so we sat down on the river bank opposite to church admiring the clear blue water with white swans and the bridge in the background. It was simply perfect picture. We kept walking along the river banks until we reached Nadelwehr or the Needle Dam. It consists of many planks of wood which can be raised or lowered by hand depending on the amount of water which need to flow out of the lake, thus preventing flooding. It is great to see that such an old invention still serve its purpose. Although overshadowed by its larger counterpart, the Chapel Bridge, the Spreuer Bridge is worthy of a visit. The original bridge was erected around 1400 but destroyed by storm in 1566, and then rebuilt again. It has the same triangular paintings as the Chapel Bridge, which are not seen anywhere other than in these two bridges. Between 1626 and 1635, Kaspar Meglinger added 67 paintings which represent the "Dance of Death" reminding the observer of how we are all equal before death, regardless of wealth and standing. They are still original, as luckily no fire has devastated the Spreuer Bridge. The name comes from the German spreu meaning chaff (the husk around wheat grains), as this was the only bridge from which one was allowed to throw chaff into the river (being the furthest downstream). The city mills were destroyed in 1875 by fire. Instead, turbines were built and used to drive a variety of machines. But the mechanical transmission of power was outdated and replaced by an electricity generator. In 1998 the power plant was completely redesigned and equipped with the latest technology available, delivering electricity to about 1,500 households in Lucerne. So one can find here a well-preserved example of 16th century art of engineering next to state-of-the-art 21st century technology. Once you cross the bridge, sit down for sometime in Muhlenplatz. This is one of several squares/former market places within Old Town Lucerne that combine a mixture of original structures with faithfully done more recent buildings, all painted and decorated to give a 16th-17th century feel to the site. This one has a nice clock tower. From here starts the upward road towards the Nine Towers and the city wall. Above the Old Town lies a ridge that runs from west to east and this is where the walls were built in 1386 still standing almost intact. Watchtowers built along the wall offered a view of the city below with nine of these towers still standing today. Three out of nine towers are open to public. The Schirmer Tower is made of polished stones and features fitted cornerstones and like the other towers it has a frieze of round arches at the top and a low pyramid-shaped roof. The next tower open to the public is Männli or Little Man Tower and is the second tower along the wall. It is named after the little iron man, a merry figure carrying a banner which is known throughout the countryside. The third tower open to the public is Zyt Tower which is named after the large clock. It is the oldest city clock and it is allowed to chime every hour one minute before all the other city clocks. Luckily we were climbing up the tower when it started ringing so we could see all the mechanical circles and ropes unwinding themselves to ring the bell. The access is free and offers amazing views of the city below. We climbed down through the other side of the city walls. The best way to enjoy a new city is to take a walk in the city turning into lanes taking getting lost in the small lanes. We were exhausted and we saw an Indian restaurant on the way which looked quite tempting but we gave it a pass and sat down at a local cafe instead. It was a delicious meal and we went back to our explorations. One of the best places I visited in Lucerne is the Dying Lion's monument. It commemorates the 600 or more Swiss Guards who were massacred in 1792 during the French Revolution, when revolutionaries stormed the Tuileries Palace in Paris. The dying lion is impaled by a spear, covering a shield bearing the coat of arms of the French monarchy and beside him is another shield bearing the coat of arms of Switzerland. The sculpture of the lion is carved out of the natural rock that surrounds it. The American writer, Mark Twain described this monument as the most mournful and moving piece of stone in the world. It was very crowded with at least 3 or 4 big tour companies present at the same time. After going around the town the whole day, I finally entered a souvenir shop but it was packed with Indians probably from a tour company from Mumbai or Pune I guessed as they were talking in Marathi while mentally converting the cost into rupees. It was so packed that I could hardly get in so I decided to just make an exit and head towards Lake lucerne. There are many cruises along the lake that leave at various intervals from across the station. There is a discount on the cruises if you have a Swiss Travel Pass. The husband and I however wanted to sit back and enjoy the beautiful and picturesque lake. Peaceful and scenic is the way to describe Lake Lucerne. There is a lovely walking area along the shore with ducks, pigeons, sparrows, gulls. One can spend hours just looking at the heavenly body of water. We sat down and had a nice icecream before we made our way back to the hotel.